The global theater linen market for healthcare application is witnessing significant traction owing to the increased focus on instigating effective hospital-acquired infection prevention measures. Hospitals are taking critical precautions related to hygiene, especially regarding the usage of linens in operating rooms. Significant funds are being diverted towards the provision of improved and technologically advanced surgical or medical equipment, and clean and tidy patient clothing. According to Transparency Market Research, the global theater linen market for healthcare application was valued at US$5,434.2 mn in 2015 and is anticipated to reach US$8,947.2 mn by 2024, expanding at a CAGR of 5.8% between 2016 and 2024. The theater linen market for the healthcare sector comprises linens employed in operation/surgical rooms in hospitals. Type of materials used in the production of theater linen used in the healthcare sector includes traditional cotton or polyester/cotton, disposable/single use, and microfiber. Of these, the segment of disposable/single use material linen segment is anticipated to expand at a relatively higher rate as compared to other material types, chiefly owing to the upsurge in the attentiveness about hospital-acquired infections. When using traditional cotton/polyester linen for the operation theater, the hospital staff is required to manually gather and dispose of all stained and infected items after surgeries in high infection areas. This makes disposable linen appropriate for usage in such situations. As a result, the usage of disposable linens has witnessed a significant surge across the globe in the last few years. Healthcare centers are increasingly placing emphasis on the infection control advantage of disposable linen versus the laundering and ongoing costs associated with the traditional linen. The impact of this trend on the global theater linen market for healthcare applciation is expected to remain strong in the next few years as well. The market exhibits highly distinctive trends across different regions. Of the key regions for the market examined in the report, Asia Pacific accounted, with over 40% of the global market for healthcare applications in 2015, surpassed the valuation of the market in regions such as North America and Europe. 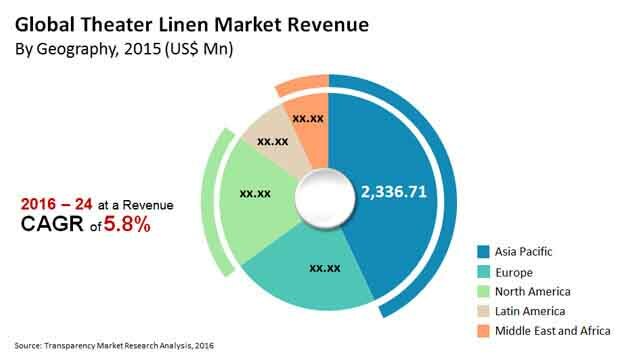 The surge in demand for sophisticated and hygienic healthcare facilities is the prominent factor driving the theater linen market for healthcare application in Asia Pacific. Asia Pacific is also expected to remain the most attractive region over the forecast period. Augmentation in foreign investments and favorable government policies are likely to provide significant growth opportunities for the Asia Pacific theater linen market for healthcare application during the forecast period. Growth in disposable incomes and purchase power parity have encouraged people to spend more on improved and sophisticated medical amenities in Asia Pacific. Demand for theater linen for healthcare application was high in China in Asia Pacific in 2015. Europe and North America are the other two crucial regional markets for theater linen. Collectively, the regions held more than 40% of the global theater linen market for healthcare application in 2015. The theater linen market in these regions is estimated to expand at a fairly stable rate during the forecast period. The rising population in North America is expected to lead to a significant rise in demand for advanced health care facilities in the next few years. This, in turn, is projected to expand the theater linen market in North America over the forecast period. Some of the key vendors operating in the global theater linen market are ImageFIRST Healthcare Laundry Specialists, Inc., Hospital Central Services, Inc. and Affiliates (HCSC), Towel & Linen (Pty) Ltd, Angelica Corporation, Crothall Healthcare, and Synergy Health PLC.